I have tried several types of classroom behavior management systems, and heard of many more, but this one is hands-down my favorite. Of course, by the time I decided to take a picture of it we were six weeks away from the end of the school year, so it's pretty beat up. The concept is very simple. You need 1 piece of cardstock in each of these colors: purple, blue, green, white, yellow, orange, and red. You also need 1 clothespin per student, labeled with their names. Layer and staple to the wall so that each color slightly overlaps the one below it, as seen in the picture. Attach the clothespins at the bottom and you're done! It's even easier to use than to make. Every day, all of the students start on "Wonderful". When they make good choices, have them move a clip up a color. When they make not-so-good choices, have them move a clip down a color. It enables students to be rewarded for good behavior, rather than just being punished for bad behavior. I've tried the having-students-pull-a-colored-card thing, which works, but then one bad choice can ruin their whole day with no chance of redemption. This system fixes that. It is incredibly easy to use, and can tell you at a glance who is having what kind of day. It can be customized with rewards/consequences. For example, if my students finish up 3 or more days on Bravo or Praiseworthy and do not go home on Yikes or below any day of the week, they get Treasure Box on Fridays. If they are on Yikes, Oh No, or Rough Day, they owe me a certain amount of recess time (10 minutes for Yikes, 20 for Oh No, and all of recess for Rough Day). You can make this your own depending on your students and grade level. Teachers, please feel free to download the above image of the behavior sheet for use in your classroom if you find it helpful. We're all in this together! Each Monday, I put one of these sheets in each student's take-home folder. At the end of the day, I circle their behavior and write any comments needed. It's not as tedious as it sounds; my kids and I have the whole process down to about five minutes for the entire class. I call them one by one to my desk, ask them what color they are on, circle it, exchange a few brief comments about their day, and then call the next student. You could circle the behavior for them while they are packing up, but I like the students to tell me themselves what color they are on. I also like that it gives me that one-on-one time with each kid, so we can discuss (briefly) why they are on that color. The parent initials in the box each night, and adds their own comments. 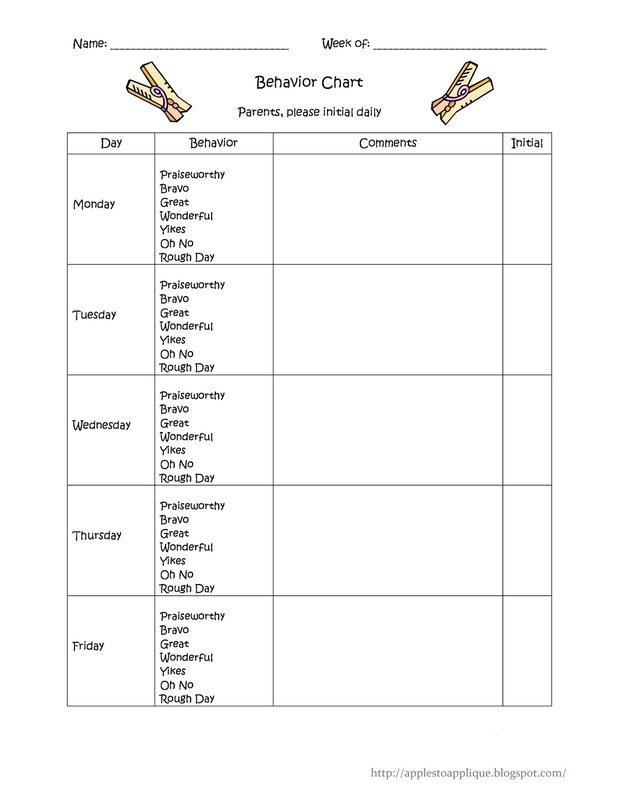 For report cards, every Friday I record their overall behavior for the week. The way I do it is if they were on Bravo or Praiseworthy 3 or more days, with no days below Wonderful, they receive an E for that week. Receiving mostly Wonderful and Great, with maybe one Yikes or one Bravo or Praiseworthy earns them an S. A couple of Yikes in one week, or an Oh No, earns an N. Finally, multiple days on colors below white, or even one Rough Day, earns a U for the week. 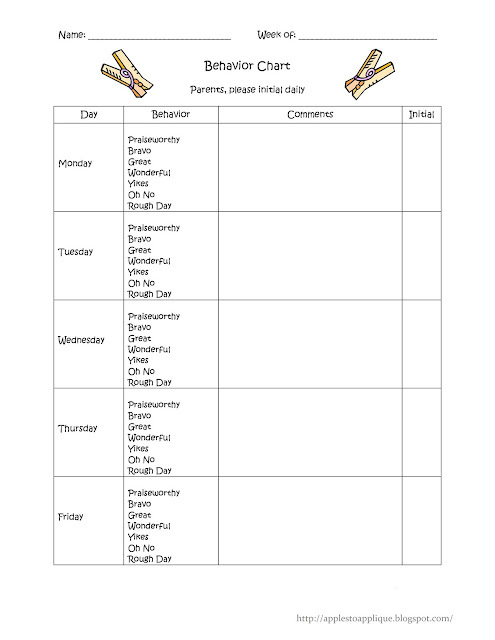 At the end of the nine weeks, I look at their average weekly behavior and use that for their report card. No more deliberating on how to classify a student's behavior--I have the data in front of me! This is also helpful for when parents question why their child received an N or U in behavior--they initialed the paper, and it has all been documented. It's all quick, easy, and consistent. Love it! I hope some of you find this helpful in your classrooms. 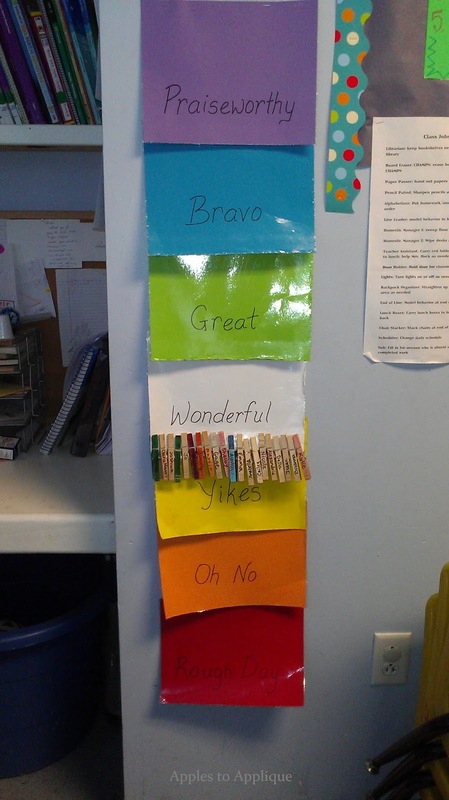 I would love to hear how you've adapted this system for your own classroom and grade level, or about behavior management systems that you've found successful!